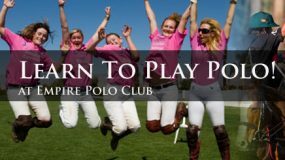 The desert is heating up, and so is the polo at Empire Polo Club! The two-week, $$ money$$ tournament has six teams competing in the 8-goal, and six teams in the 4-goal. Sunday morning, Cotterel Farms met STG/Chapel Hill on the field for a nose-to-nose battle. The match began with both teams successfully making two penalty shots, ending the first chukker tied at 2 to 2. In the next two chukkers, scored goals went back and forth, making the half-time score Cotterel Farms 4, to STG/Chapel Hill 5. The trend continued, with Cotterel Farm’s two points in the fourth chukker being answered by STG/Chapel Hill’s one point. The teams came out swinging in the fifth. Cotterel Farms made three goals and STG/Chapel Hill two. Chukker six began with a Cotterel Farm’s advantage, 9 to 8. 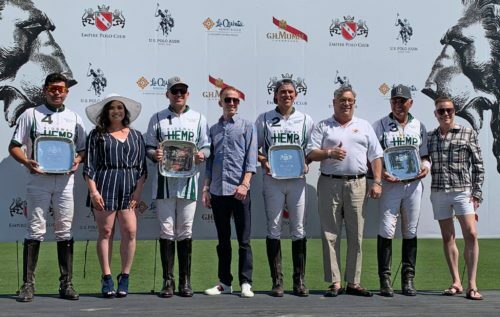 Both teams were bound and determined in the final chukker, and each scored twice. Cotterel Farms persevered, and won the match, 11 to 10. Ridgway Hemp won the 8-Goal featured match on Sunday. From left to right: Carlos Hernandez, Beau Staley, Quinn Evans and Memo Gracida. Trophies were presented by Leaskou Partners. Spindrift challenged the Ridgway Hemp team. Bickford initiated the scoring in the noon-time match, putting two shots through the posts. 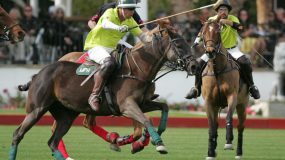 Hernandez scored once, (the first of his five goals), ending the first chukker 2 to 1. Both teams made two goals in chukker two. Ridgway Hemp was able to score two un-answered goals in the third time period, sending teams to half-time with a score of 4 to 5. Ridgway Hemp had the advantage in the fourth and fifth chukkers, putting five points on the board, to Spindrift’s one. The Spindrift team dominated the final chukker, scoring twice and keeping their opponents scoreless. At the final horn, Ridgway Hemp was the winner with the final score of 7 to 10. Evergreen and Lockton had a by. This year’s Lion Cup pitted Empire against Archangel. Fargey’s one goal in the first chukker put Empire up by one. He added 2 successful penalty shots, which the Archangel team answered with four goals, ending the second chukker, 3 to 4. Empire out-scored Archangel in the second half, and Empire took the match 7 to 6. Hanalei Bay started the scoring against Columbia West, making two goals. Columbia West put one on the board, ending the first time-period 2 to 1.5. In chukker two, Hanalei scored the only goal. The trend continued in the third, which ended 4 to 1.5. After out-scoring their opponents again in the last chukker, Hanalei Bay was able to defeat Columbia West, 7 to 3.5. S4K and Luna Polo Competed in a tight match! At half time the score was close at 3 to 2, favor S4K. Luna Polo rallied in the third chukker, scoring four points to Luna’s two. In the final chukker, both teams put two through the posts. Luna Polo was ahead at the final bell, and won with a score of 8 to 7.